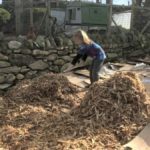 3 days of great weather lets us get some of the outside jobs sorted. Sowing beans, planting garlic and putting the grandson to work. 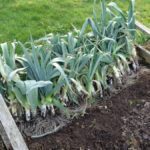 By heeling leeks in, they'll effectively store in good condition for another couple of weeks at least - stopping them bolting and freeing up bed space. 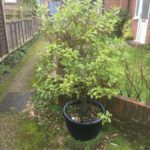 Bay Tree Looking Ill – What to do? my bay tree which is looking rather sparse for leaves. Could you give me any guidance on how to encourage thicker growth? 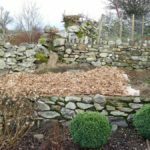 Creating a new decorative border, mulching with woodchips and cardboard, storm damages coldframe, windbreak leylandii growing fast. 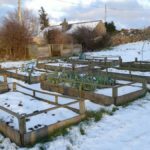 Looking at the snow blanketing the fields and plots, covering the plants waiting patiently for spring and warmth to burst back to life.